We introduce and discuss kinetic models describing the influence of the competence in the evolution of decisions in a multi-agent system. The original exchange mechanism, which is based on the human tendency to compromise and change opinion through self-thinking, is here modified to include the role of the agents’ competence. In particular, we take into account the agents’ tendency to behave in the same way as if they were as good, or as bad, as their partner: the so-called equality bias. This occurred in a situation where a wide gap separated the competence of group members. We discuss the main properties of the kinetic models and numerically investigate some examples of collective decision under the influence of the equality bias. The results confirm that the equality bias leads the group to suboptimal decisions. - Workshop on Control Theory and Applications , GSSI L'Aquila, Italy, March 28-29, 2019. - Workshop on Asymptotic methods and numerical approximations of multi-scale evolutions problems, and uncertainty quantification , ENS Rennes, France, May 16-17, 2019. 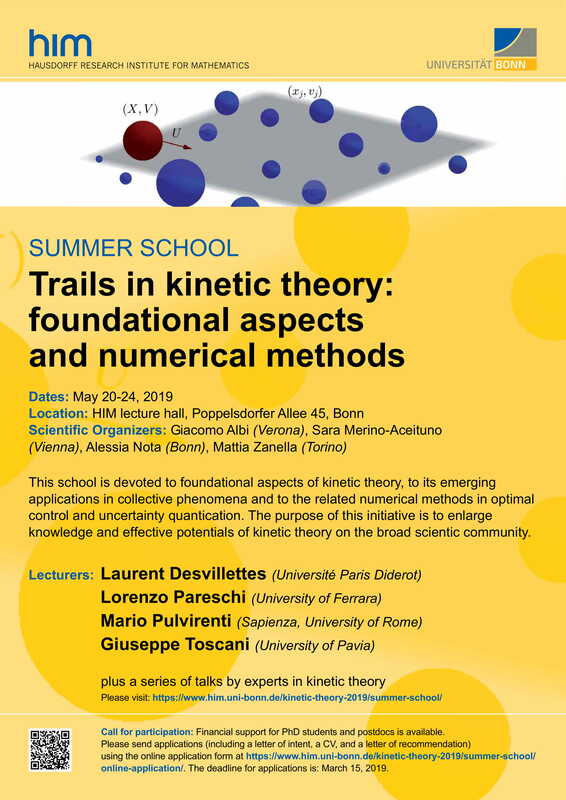 - Summer School Trails in kinetic theory: foundational aspects and numerical methods, Hausdorff Institute, Germany, May 20-24, 2019. 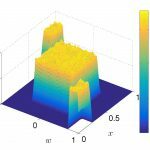 - 28th Biennial Numerical Analysis Conference, Minisymp "Computational methods for model-driven optimization and control under uncertainty", University of Strathclyde, Glasgow, June 25-29, 2019. - International Congress on Industrial and Applied Mathematics, ICIAM 2019, Valencia, Spain, July 15-19, 2019. - XXI Congress of the Italian Mathematical Union (UMI), University of Pavia, Italy, September 2-7, 2019. - Thematic Program on Quantum and Kinetic Problems: Modeling, Analysis, Numerics and Applications, Workshop 3 on Emergent phenomena – from Kinetic Models to Social Hydrodynamics , Institute for Mathematical Sciences, National University of Singapore, December 16-20, 2019.